2 Mirozhskaya Embankment, Pskov, tel. : +7 8112 57-64-06, +7 8112 57-64-03. The Spaso-Mirozhsky Monastery, which was founded in 1156, is an architectural ensemble of tremendous historical and artistic importance. Architecturally, it consists of several monuments. The Transfiguration Cathedral, mid-12th century. 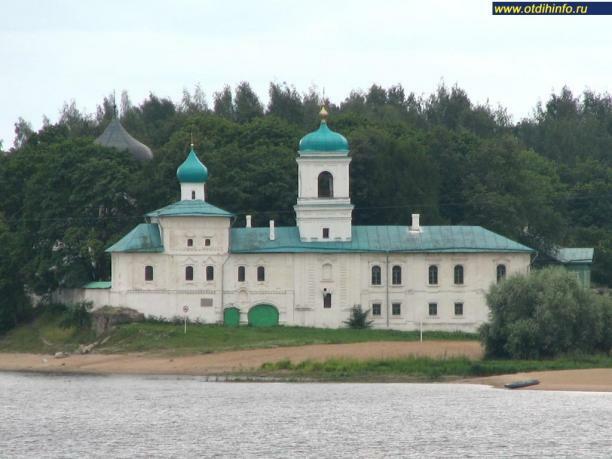 The oldest Monastery's temple is a centre of Christian Enlightenment in Pskov. The Cathedral was built by efforts of St. Nifont, who apparently suggested an idea of magnificent frescoes of the Mirozha River, which were created by Byzantine painters in the mid 12th century. The frescoes, 80 % of which have survived and which completely cover the walls, is a world-known cultural asset. The Cathedral is a prototype of Byzantine architecture and has no parallel. The massive cross-domed temple with one dome upon a wide lantern drum "looks like a cross-shaped building with low corners, which is inscribed into a quadrangle" (Alexei Komech). In other words it creates a visual impression of a Greek cross. Severity, simplicity, and deterrent power of the Cathedral affected Pskov School. The Cathedral and its frescoes were repeatedly studied and reconstructed — for the first time by Vladimir Suslov in 1887, then in the 20th century by A. Anisimov, D. Bryagin, G. Alfyorov, and V. Sarabianov. St. Stephan's Church, 17th century. It replaced an old church of 1406. It is a gate refectory church on the basement with adjacent Holy Gates. Moscow features can be noticed in the architecture. Facades are decorated with bleached brick cornices, ornamental belts, and pilaster strips. Windows and doors are framed by small columns with flutes and pediments. Interior is double-hight and covered with a cloistered vault. A bell tower of 1879 features a dome-shaped roof and is adjacent to the Holy Gates. A two-storey Fraternal Building makes a gala facade on the northern side and borders with the bell tower. Cleric Building, 16th century. It is situated to the west of the Transfiguration Cathedral. A wooden floor is added above an extended ancient stone basement.